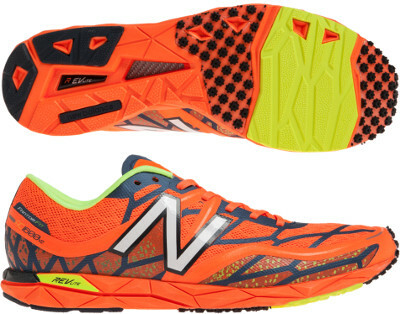 New Balance 1600 v2 are neutral racing running shoes. The New Balance 1600 v2 is the model from the american brand which fills the gap between track spikes and road racing shoes, therefore expect lightness and great response but not huge cushioning nor long endurance. Major change from its predecessor the New Balance 1600 is the new seamless upper using FantomFit that removes extra overlays to provide a softer feel. This model features great responsiveness thanks to lighter RevLite midsole and DYNARIDE outsole that improves traction even on slick roads. From independent tests drop seems lower (6 mm) than official specifications (8 mm) and toe box is a narrow one, so please take both into account when selecting your size.